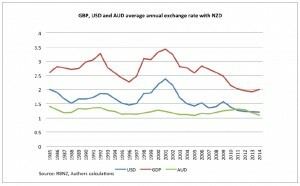 In a previous Briefing Paper, I discussed what is meant by an over-valued dollar and argued that the New Zealand dollar has been over-valued for much of the past decade. This has fewer benefits than assumed for consumer prices, and has costs for exporters. 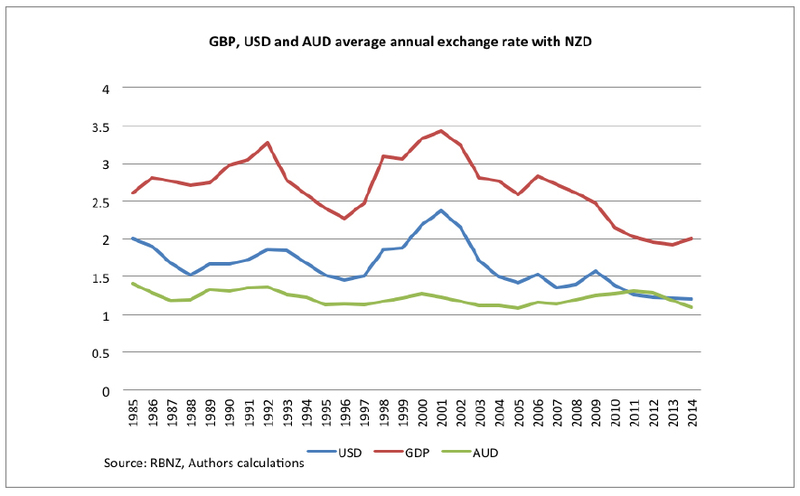 The graph below shows us the return of each of the currencies in NZD terms. For example, looking at the Great British Pound (GBP), in 1999, 1 GBP would have returned 3 NZD, where in 2011 the same GBP would return only 2 NZD. 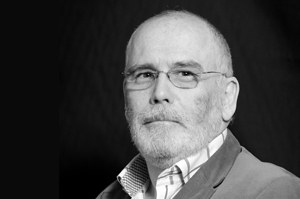 This change represents a direct and substantial effect on returns for exporters. Over the last year, those defending the high level of our currency have pointed to our “rock star” economy, with improving economic growth and a record terms of trade due to high commodity prices as factors justifying the sustained high level. However over recent months growth has slowed; most notably with the large decrease in global dairy prices which have fallen 48 percent from highs in February. This drop in our main commodity prices without a significant drop in the NZD to counteract these returns has even led to openly expressed concern by Federated Famers. While many factors drive the high values of the New Zealand dollar, perhaps the biggest and most easily identifiable factor is the interest rate differential between New Zealand and the rest of the developed world. 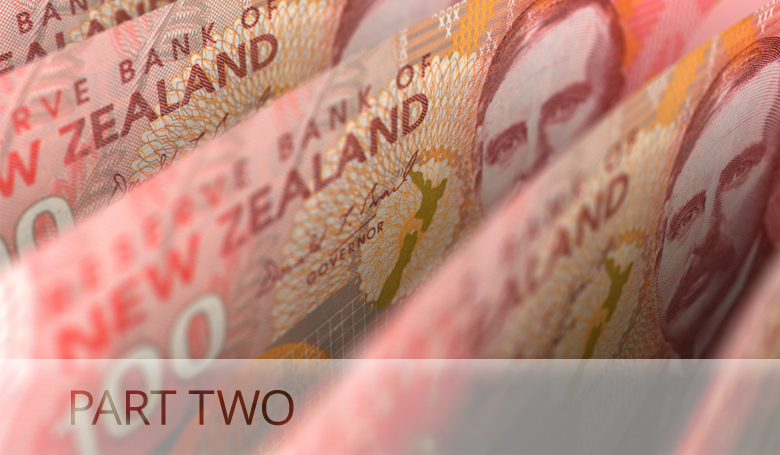 Since the GFC, New Zealand held rates at 2.5 percent until 2014, which is low from a domestic standpoint, but high compared to rates around the world which held around zero, and also saw significant additional stimulus, particularly from the Federal Reserve. This disparity in interest rates is largely what appreciates our currency, with overseas investors demanding NZD’s in order to take advantage of higher rates, particularly when there is a vast amount of low cost money in international markets resulting from the policy approaches in the USA, UK and Japan. The fact that New Zealand is seen as relatively safe and stable adds to this pressure. This is describing how monetary policy decisions (for example an increase in the OCR) drives the exchange rate (which appreciates due to interest rate differentials etc. ), which then in turn lowers tradable inflation. This is the primary mechanism by which inflation has been controlled in recent times, as evident in the graph below. Continuing to rely on depressing tradable inflation in order to control domestic inflation is not sustainable in the long run, and damages the tradable sector. 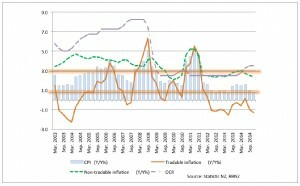 As the above graph shows, since towards the end of 2011, tradable inflation has been significantly lower than domestic inflation, and even felt deflation as prices fell. While our currency is somewhat a hostage to global factors, such as stimulus, devaluation and interest rate decisions of other central banks, the RBNZ does have some power to influence it. In September 2014 the RBNZ announced that they had intervened in the currency market during August, selling a net NZ$521m. 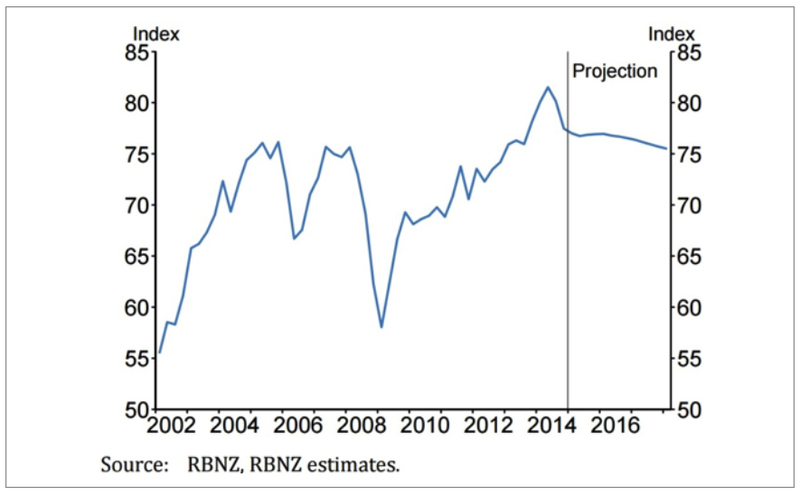 Before this was revealed, the RBNZ also released a speech entitled “Why the NZ exchange rate is unjustified and unsustainable”, which appeared to be a pre-justification for their announcement using currency intervention, and also an attempt to talk the exchange rate down. This action from the RBNZ followed many months of repeated expressions of dissatisfaction towards the level of the currency in nearly every OCR and Monetary Policy Statement since the new Governor came to office, but they had previously failed to action a substantive response. The Trade Weighted Index or TWI is the value of the New Zealand dollar compared to the currencies of major trading partners. 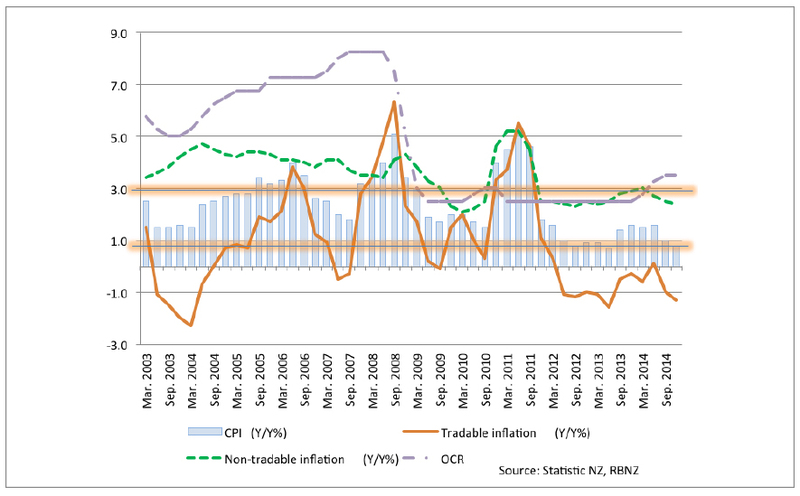 Below is a graph of the TWI, with RBNZ forecasts until 2017. This forecast shows a slow downward correction over the coming years. However this is over some time, and remains relatively high even at the end of the forecast period (TWI of 76.4 for March 2017 quarter). 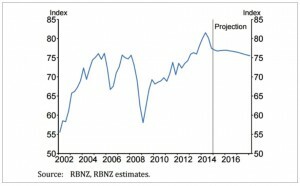 If we take the view that the NZD is currently 15 percent overvalued, the RBNZ’s current forecasts only predict a 5 percent drop in the TWI between now and 2018. Clearly, following our current path alone is not enough to fully correct the currency, at least over the medium term. If this correction could be accelerated, conditions for manufacturers and exporters would be greatly improved and the natural consequences of a misplaced exchange rate ameliorated. This will lead to better margins that allow for higher investment to fuel future growth, innovation and employment, which has huge benefits for the wider economy. The RBNZ could be more active in tackling the issue head-on to explicitly drive a more balanced and fair value currency. Macro-prudential interventions are available and seem to work – more effort in this area rather than relying only on interest rates (higher rates relative to offshore puts upward pressure on the NZD) would help accelerate the correction of our currency towards fair value. Maintaining a currency closer to fair value, without unnecessary volatility is vital to support the competitiveness of our exporters and manufacturers so they can invest in the traded sector with some confidence. It is clear an expanding traded sector is important from the standpoint of innovation, creating value and jobs that New Zealand needs.